In 2015, the U.S. Patent and Trademark Office processed 629,647 patent applications. On average, approximately 55 percent of applications submitted receive patents. One way to improve your odds of getting a patent grant is to build your first prototype. While submitting a prototype is not strictly required by the U.S. Patent Office for submitting your application, it does serve to demonstrate that your idea has been thought through in sufficient detail to merit consideration. Here are four steps to get your first prototype built so you can turn your idea into a patented, profitable product. The first step toward turning your idea into reality is getting it down on paper. Draw your idea to help you visualize your prototype in greater detail. While it is possible to use a digital drawing program for this step, it may be more efficient to start on paper first. For one thing, in the early stages of creating your prototype, you’ll have a lot of ideas running through your mind and competing with each other. You’ll save time by drawing these rapidly on paper instead of investing time perfecting a digital drawing. 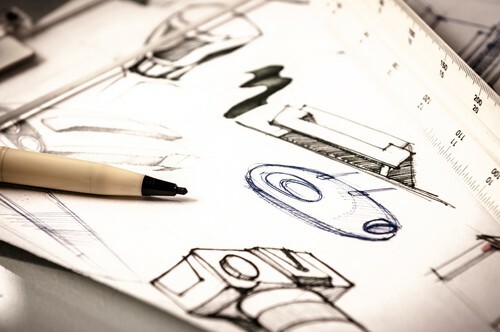 Keep a sketch notebook to provide documentation that can be used when submitting your patent. It also may come in handy if you ever need to defend your ownership of your intellectual property. Sketches drawn by hand can carry more weight in court than electronically generated drawings, says intellectual property adviser CreateIP. At some point it’s going to be invaluable to create a digital sketch of your idea. A standard digital design tool used by engineers and other professionals is AutoCAD, which enables them to make both 2-D and 3-D renderings. A 3-D rendering lets you rotate and animate your virtual sketch, so you can visualize it from all angles. Tools such as NVIDIA Iray, CATIA Live Rendering and Quadro can further enable you to transform your 3-D drawing into a photorealistic prototype, helping you see approximately how a physical version of your design will look. If you’re not skilled with computer drawing and rendering tools, professional graphic designers or prototype designers can assist you with this step. Once you have a virtual prototype, you’re ready to build a physical prototype. If you have the skill, you can build one yourself. If you need help, there are several types of resources you can tap to get this step done. One way is going to a professional prototype designer. An alternative is getting a designer or engineer to build your prototype. If you’re cash-strapped, you might seek out a handyman or advertise at an industrial design college. Once your first prototype is built, you may find flaws that need to be corrected before you seek a patent. You may need to build several prototypes to get a good one done. Typically, early working prototypes are built of less expensive materials than later versions to save money while fixing design flaws. As you improve your design, you can eventually make a prototype that replicates your actual product as it will be sold to consumers. Once you have a working prototype, you’re technically ready to apply for a patent; however, you might want to take the additional step of locating a manufacturer that can produce your product at a profitable price. If your idea is going to be profitable, you need to be able to build it at a cost that is low enough that you can cover expenses without cutting too far into your revenue. Manufacturers that offer free samples and 3-D printing can help you cut costs both in testing and production phases. For instance, manufacturerApple Rubber provides customized o-ring samples to help you test your prototype and determine how to produce it at a cost-efficient price. Go to multiple suppliers and manufacturers to get estimates, so you can determine the most cost-efficient materials and methods for putting your prototype into production. I’m starting on my jorney to making a very long time idea come to life. I am sketching the idea and asking you if getting a copyright is good enough? For now as I cannot afford the high cost of a patient . Check out inventright.com or buy the book One Simple Idea. You will find a lot of your answers there. Patents cover processes, physical propeties, shapes and mechanisms. Copyrights cover works of art, books, pictures, movies and music. Both are forms of intellectual property. You don’t need to file anything to claim a copyright, but you do to claim a patent. Enforcement is another matter. You have to register a copyright or have issued patent claims to sue for infringement. You can file a provisional patent application as a sort reservation for just $65 on your own. You could also get help gor anywhere from $200 to $2000 to file a provisional. I have a prototype need a manufacturing to make it.i liver in Atlanta ga were can i go. Where did you get your prototype done, how much was the cost? I have my ugly prototype and its working well,my invention will surprise everyone. hi kendal. im looking for an interested party to share in numerous products that i have designed. im looking for an equal partner to help with all aspects of producing my products and getting them to market and in return i offer an share of thei business and profits. i dont expect you to do all the hardwork while i only collect the money ill commit to an equal amount of the work, i have lots of great ideas but lack the knowhow for turning my ideas into a viable business and i also dont have lots of free cash hence to need for somebody with the expertise. Where are you located? I am in Denver and also looking to build a prototype. I’m in the start up phase (sketch) but will need a prototype & digital (3d) drawing. Are you able to produce 3d image as well? I have started the process of patenting this idea. Looking forward to applying soon. I have prototype already in steel form.its actually in several different parts. having the prototype in steel, is that good or bad. having the prototype in steel, is that good or bad. I also wanted to know what it would cost to have a mold made of some of the parts, some could be plastic. how do I find out if some parts could be made of a stronger yet lighter material. do they make plastics that can support 150-250lbs. it would be great if all the parts could be made of some type of strong plastic or lighter material. Need someone to design prototypes that can be used for mass production. Is this something you do or have a referral? Pls email me at [email protected]. Serious inquiry. Thank you. Brad, I am in the Toronto area, and I do work here and ship it to you when finished. Slyvia, yes I do make 3D models and physical prototypes. Mia, I am sending you an email now. Clayton, it really depends on the thickness of the plastic part that you are proposing, also what is the environment it is going to be exposed to, i.e. Direct sunlight, salt, water, friction, etc… Please send me an email and we could discuss it. Jim, I am emailing you now. Tarek, email me. What type of prototypes you make? I would like more direct information on making a Prototype of an Invention. I have a pattern for my idea , Sketch and a rough prototype. I’m looking forward to take it to the next level. I have created a prototype to be used in the preschool classroom. It is an educational musical toy or tool and teachers and others really like it. I think there is potential with this product. It has a good name and people think I should trademark the name. I just sent in a VA copyright form to the copyright office with photographs of it. I made the product with felt and sewed it by hand. So, what would be the next step? I wonder if I need a patent. Do I need to get someone to manufacture it first? I need to make sure if I manufacture it I can sell it. I don’t want to waste money on having it made if I don’t already have buyers. Any feedback would be appreciated. I have had an idea to create a line of women’s pants I need a reputable USA made manufacturing company please….? Looking for someone that would be able to build me a prototype of my design for an innovative way to sleep outdoors. Thats a quick and easy guide on how to get from idea to mvp. Thanks for sharing that! I know you didn’t discuss much if any about how to do the Customer Development part for building and experimenting with an MVP to actually find the customers problems you are trying to solve with your MVP. If we do it right, we can find our target users and truly understand them before we even write the first line of code. 2. Do problem-interviews with people who fit to this hypotheses and try to falsify the problem hypothesis. 4. Then go ahead and present this target group a solution in a solution-interview. 5. Iterate until you are certain that this solution solves their problem. 6. And then you can build your first MVP. I know there are many challenges along the way, hidden in the details. What helped me most was talking to other founders who had done it before. They have learnt the ropes of customer development to truly find problem/solution fit. I actually interviewed many of the founders I talked to and shared it with your on our podcast called Nerd Entrepreneurs. Check it out and get inspired by their tactics and tools around the very beginning of any new company. I made a prototype for a recreation product out of rubber and I’m looking to make it out of plastic so it’s lighter and more durable. Looking for someone who can help me move into the next step of my idea. Please email me. Hi Brian, I make prototypes, I just sent you an email from [email protected], looking forward to hearing from you.